Fresh off the Pacific Crest Trail, we didn’t fit into a big city like Vancouver, but there we were. The first few days were shocking. Traffic flew by uncomfortably fast, our physical surroundings were unnaturally filled with stern right angles, and there was constant noise. People crowded the sidewalks, but didn’t acknowledge one another. Even music, though enjoyable, sounded foreign. We were happy to rest our feet, but mentally it was rough to switch from 5 1/2 months in the backcountry to city life. 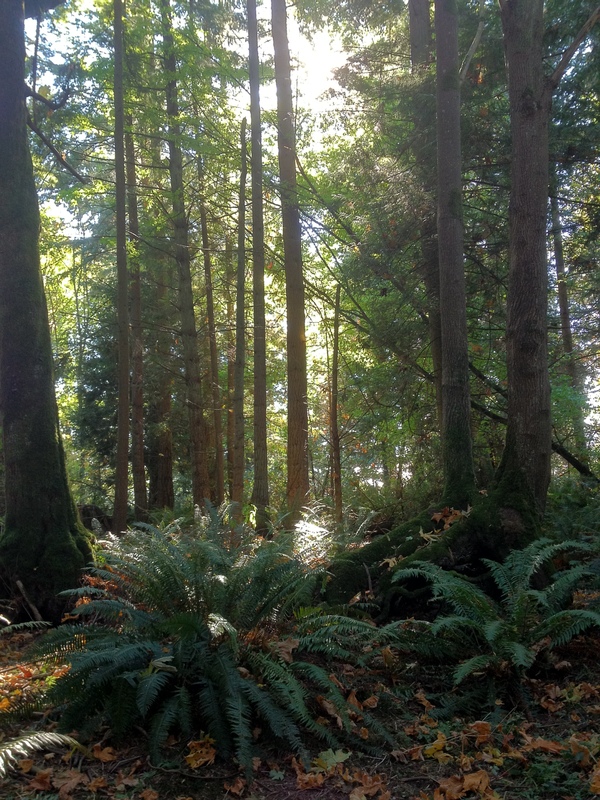 Luckily, Vancouver has some world-class city parks. 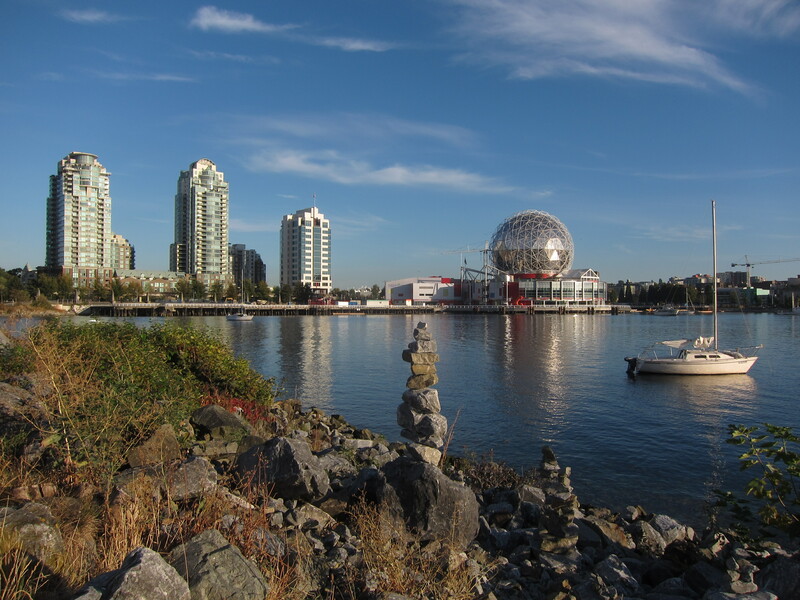 We found that the calm and relative solitude of Kitsilano Beach and Stanley Park eased our transition. After a few days in Vancouver, we hopped on the bus and crossed back into the United States. We plan to spend the next few months visiting friends and family while working on the PCT landscape photo book, and this bus ride began that phase. In Seattle and Portland we caught up with friends, some we hadn’t seen for many years. 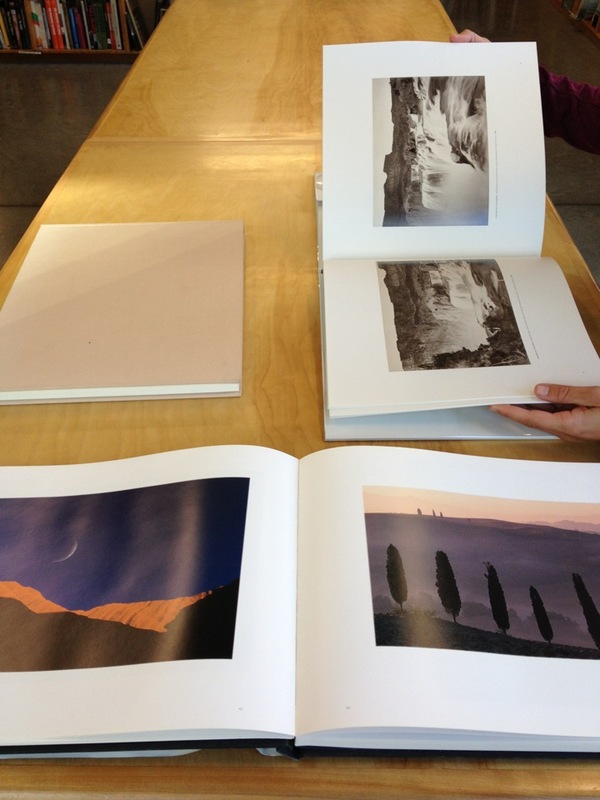 We also began reviewing Shutterbug’s photos, and browsing art books to determine our layout and font preferences. Our minds are slowly adapting to this new lifestyle, but we still miss the wilderness. Working on the photo book conveniently allows us to relive part of the hike each day. Plus, the book is an exciting new challenge to tackle, and we love challenges! Congratulations to both of you. Thank you for sharing your awesome Journey. Thank you Willito! Glad we ran into you on the trail. With you all the way! Looking forward to your next adventures. Trying to think of what might be interesting to you if you happened to meander through Wisconsin at some point…We have a very long trail that marks the southern edge of the glacier…..? That’s the Ice Age Trail, I think. We’ve only met one person who has done it. I like the idea of trails that traverse something historic, like a glacier that no longer exists. Thanks for the glimpse into what your “re-entry” has been like. I can only imagine how hard it is to readjust to city life after so much time in the wilderness. We can’t wait for that book! It is strange to adjust, though we are gradually doing so. For some reason the adjustment is easier going into nature from a city. At least, it’s easier for us. We have a good start on the book, which feels like a journey of its own! Ha, you’re right! We ran into a few other thru hikers at Next Adventure. We went to the gathering at Apex too, but we couldn’t stay for long since we had planned dinner with other friends. Sorry to miss you in Portland (we’re in Eugene now). First of Congrats on conquering the PCT – WAY TO GO!!! Second of all What a SHOCK to go back into a big metropolis. Good Luck on the Book – cannot wait to check it out:) Have a Wonderful Day! Thanks! It has been shocking in some ways, but working on the book has helped make the transition more focused and enjoyable. We are really excited to show people the trail in book form. I’ve enjoyed your account of your PCT hike. I lived in WA many years ago and spent as much time in the mountains as I could. I now live in NJ and return to the western mountains as often as possible. Your account allowed me to experience it vicariously. Thanks!!! Washington was quite beautiful, especially with all the larch trees changing colors. We are happy to share! Hats off to you both for meeting the challenges of the PCT together! I was just thinking of you yesterday and the strange transition it must be for you. I was on a hike in the woods with my kids collecting autumn leaves to send to my sister who lives in Mexico and misses the Fall season of Ohio. Many aspects of your incredible 5 + month hike (life-giving nature of it, developing a deeper relationship with each other, appreciating the miracle of life around you everyday) are so what I believe God made the earth and humanity for. You took what you knew and through the hike discovered it deeper in your hearts…with a daily, growing disciple of the physical challenge! The transition will be unique! (many you meet will have never discovered this gem.) I hope you both can now discover God continuing to take care of you with the same life giving and deepening essence (but it may take a discipline of yours in different ways than the physical). I’m glad you have each other to walk through transitioning. Thank you for sharing your truly awesome experience with us. I’ve so enjoyed the stories and pictures! You are both very gifted. God be with you in the steps of life ahead. Love, Gina, Ed and…james, alice and eddie Willig. Thanks for this deep and thoughtful comment! We are grateful we were able to experience so much beauty in just a few months. The hike has definitely changed us, which is part of what makes the transition challenging. Sharing the beauty with others made it even better. How cool that your kids were part of the adventure too! The process of book publishing is a mysterious path that many of us will never tread. Not sure if you are interested in sharing it with us as intimately as you shared your PCT adventure, but could make for some interesting blogging. Must be lots and lots of decisions that go into it, that us readers have no idea of. Regardless, we will be glad to see the finished product. All the best on re-entry (crossing the streets gave me the willies when I came out of my summers in the wilds!). You’re right, publishing is a world of its own! We are still getting our feet wet there. It will be really exciting to hold the finished product when we are done. Agreed about crossing the street. It’s hard to get used to cars! As a student I always new you’d go on to do great things in your life, Anna. I’ve enjoyed watching this journey from a far and thank you both for sharing your life over the past 5 1/2 months with others through this blog. Now the challenge of going from one journey to another begins… I know you’ll both get through the transition with the same courage, hard work, and joy we all witnessed from your hike along the PCT. Enjoy the journey! Thanks for the kind words, Bryan. The switch to city life and looking at a computer monitor for large chunks of the day is jarring, but like you said we’re adjusting and working hard on our future plans. Hope you’ve transitioned well to teaching at Ohio Northern. Congratulations! What a story. I’ve been so busy that I missed your last few posts and have been wondering about you two. Glad you made it back and your account of experiencing civilization again was provocative. Kind of like time traveling, maybe? Can’t wait to see the book! Thanks! It’s a good thing we are finished because as of Wednesday, the PCT in northern Washington received a foot of snow. It is kind of like time traveling to jump from the wilderness to a big city. In many ways we prefer the ancient experience of living in the wild. That is awesome! We met lots of section hikers on the trail, and all of them were having a great time. You will love the PCT!